On Thursday 18th of December, the entirety of WAIT met in Lancaster Gate for the 2014 Christmas concert. We brought friends and family to watch, and kicked off with a warm and lively introduction from the MCs, Josh and Cara. They led us through the evening, with performances ranging from African singing to incredible beat boxing. There were a couple of talks about the message of WAIT and our progress, with reports on projects in Africa and Albania. Our WAIT performances included an energetic, synchronised and punchy dance to ’Chandelier’, an original, emotional and touching drama piece, an expressive and beautiful contemporary dance and a treat of songs from the music group. Inclusive of the raffle, the final WAIT song and Christmas songs to end on a festive high, I’ve no doubt that everyone enjoyed the night! I’d like to give a huge thank you to Carmel and the other organisers of WAIT, on behalf of the whole team. You’ve all invested so much and the concert wouldn’t be as great as it was without all the hard work and practise by every member of the team. Many thanks to everyone for coming! Until next year. DC WAIT has been busy with many activities. First, they had a few performance in churches and summer camps. Two Year of Service joined the DC WAIT team. They are Molly Rhodes, from the Worcester WAIT Team, and Rachel Roche, from Iowa. The team continues to run their fabric store that is the main income for the team. They continues their work with a local food bank and neighborhood activities. During September to December, the team worked with WAIT parent Roddy Portlence to run two kiosks at the local mall, The Mall of Prince Georges. The kiosk were customized lamps and personalized ornaments. Members gained business skills, customer service skills, and work ethics. Currently, the team are working on new songs, dance, and music. The team has a performance on Feb. 1st. There has been development of an interstate trip to New York and an international trip to the Philippines. DC WAIT welcomed Kensaku Shibata. He does Hiphop dance of poplocking. He has been able to perform in a few performances. He has been helping with developing our WAIT store with taking pictures and designing a website. 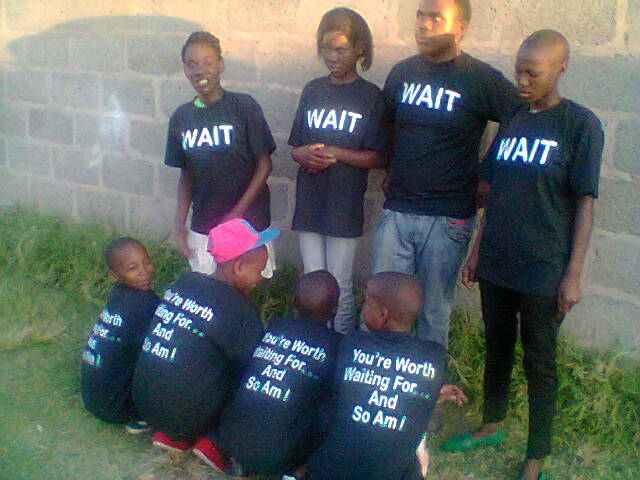 Lesotho WAIT Team had a few performances recently. They are working on translating the skit to their local language. Also, a sound mixer and 20 WAIT T-shirts were bought for the team. 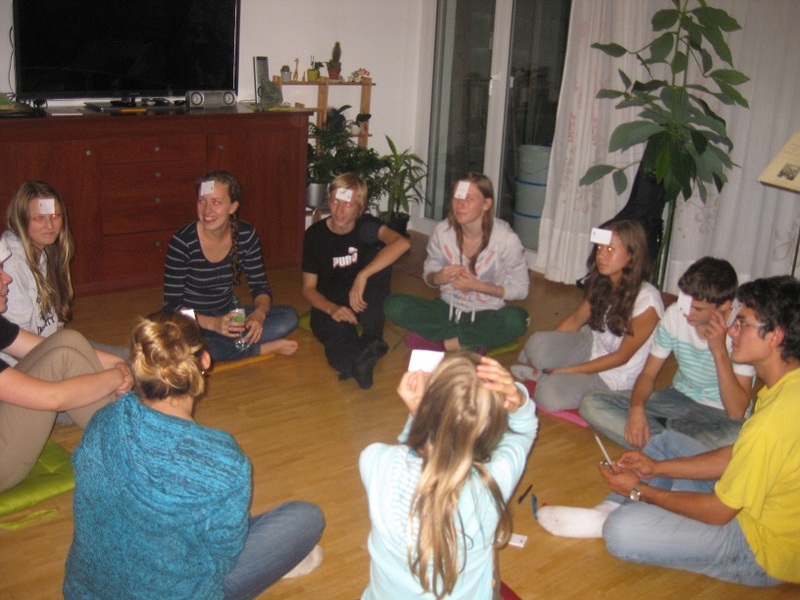 On September 21-25 2013 , Cathlene Bell-Dumas, past NJ WAIT member and current Switzerland WAIT Coordinator had a WAIT training in Lausanne, Switerland. She trained about 10 new members. They learned "A Rose is A Rose" dance, the WAIT PPT, and other acts. On December 14-17 2013, Ohio and Omaha WAIT teams travels to Cedar Falls, Iowa to start a new WAIT team. 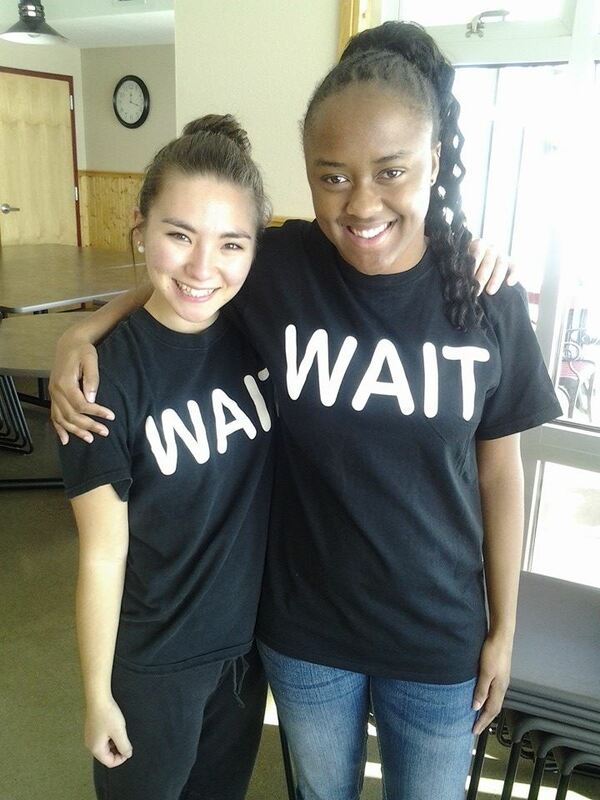 A weekend full of learning of different WAIT acts. Rachel Roche, WAIT member and Bill Roche, WAIT Parent, were the spearheads of the training. Moved by a desire to support a newly blessed couple, Nifa and Baraza, and the advance of the providence in strategic Kenya through events around AIDS Day, I flew to Nairobi with my spiritual daughter, Nifa. At our arrival, we were picked up by Fridah, a Kenyatta University student, and Nifa’s cousin, Julie, and went to visit the Peace house where we met the national and sub-regional leaders and briefed them on our plans for the 2 following weeks. Our first stop was at Kenyatta University where the event prepared by Fridah almost got cancelled. But we were able to give our UPF presentations and establish good contacts with about 100 students specializing on community-based development. 5 of the students joined us at our next place, Eldoret, 6 hours away by bus. There, we were welcomed at the family Care center, where the modest facilities were graciously lent to us. 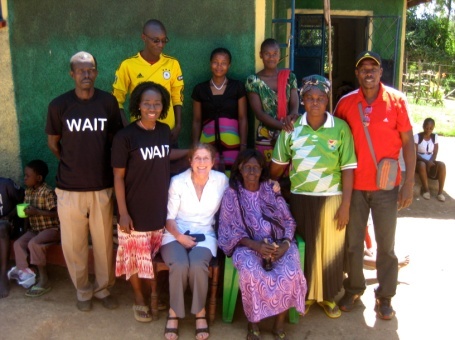 Nifa’s cousin Marie helped us make the capes for the skit and together with the young leaders, found a meaningful phrase about waiting for the beloved one in Swahili, that was added on the WAIT tee-shirts we got printed. We were able to educate and train about 40 youths in AIDS prevention and WAIT skit and dances. Willis, the WAIT coordinator joined us there and supported us. Marie’s parents also welcomed us in their home and we could share the deep meaning of the fall of man to such degree that Nifa’s uncle, who is a Salvation army officer responsible for about 40 churches in the area, advised us to write to the national Salvation army headquarters in order to arrange a tour in Kenya and teach this truth clearly to the young people. At the main event, on Sunday December 1st, the skit, dances and explanations particularly interested the press and our team came on national TV. I encouraged the authorities to invest more in prevention through character education rather than in just distributing free condoms and medicine. The organizers of the event had promised that all the performers, mainly HIV positive groups with youth and children, would receive lunch after the event. But nothing was given out, which shocked all the people who had participated and became a subject of criticism around the assumed huge funds available for AIDS. We realized that the only way to change the AIDS situation sustainable is through a drastic change of every layer of society from the corrupted attitude of taking for oneself to living for the sake of others. We moved on to Busia where Nifa’s spouse, the famous Kenyan former football national coach Baraza welcomed us. He had organized an event at his village. It became the opportunity to present his blessed wife to his mother. We then moved on to Kisumu and visited Maseno University. On the way, our small team took some “tourist” pictures at the equator before settling down for 2 days at Fridah’s home, in the countryside full of fruits, animals and sunshine. We presented our approach to the staff of the AIDS Unit, with the support of the Dean of students. Visiting a choir that was practicing for graduation, Willis gave explanations about WAIT. We then met Fridah’s youth club and educated them on our abstinence-based program. They showed much interest in participating in more activities and wearing the tee-shirts. It took us 7 hours of bus to get back to Nairobi. We organized a football tournament in a poor neighborhood of Nairobi, near a slam. The 5 students who had accompanied us through our journey came with one more student. The young football players under 15 listened to the introductory speeches presenting football as a means for developing character and then played wholeheartedly, even without shoes. The WAIT-Team showed the skit and the winners, the high rise, trained by a member coach Makao, elated, received the cup from the hands of Baraza. For Sunday service, the 6 students came, and listened to an inspiring sermon as well as to some testimonies. Two Kenyan members living in the US but eager to support their country were also present. The five students and Baraza received certificates of Ambassadors for Peace. Two of them started the 7-day workshop that same day and other 3 came the next day, as they had to finish an assignment for the University. The second evening of the workshop, I gave my testimony of how, even having everything external in Switzerland one can possibly dream of, I was unhappy and searched for the purpose of my life for 8 months around the world before finding Divine Principle in Australia. This kind of testimony breaks many concepts about happiness having to do with owning material things and having a position in society. Being able to show pictures of successful second generation children is probably the best testimony one can give of the blessing and life of faith. The last day, we met at the Peace house one more time and with heartfelt sadness said goodbye to the national leader couple and UPF staff, praying for them to be able to fulfill the huge task ahead. Kenya has great potential of development as people have an open heart and they understand spiritual realities right away. Moreover they are searching for ways to better their situation. Doing WAIT activities and teaching revived our hopes for a better world. Through the giving and receiving beyond ethnic groups, cultural spheres and national barriers there is multiplication of energy, love and mutual understanding. Thus, the world migration is benefitting everyone and, as migrants start contributing to their home as well as to their guest country, breakthroughs in all fields take place to the benefit of all actors involved. My deepest desire is that the Divine Principle can be spread around quickly through numerous workshops. It is the most powerful tool that can motivate the youth to develop their heart, character and personality before receiving the blessing and entering in the conjugal sphere to found a family. I believe that if only 1% of all the funds invested by the world to help Kenya deal with AIDS were invested into this new preventive approach the AIDS-pandemics would fade quickly. But even without counting on such funds, if all those who have heard Divine Principle act from their heart of love and share it, great sprouts of “One Family under God” will appear in many locations in Kenya by 2020.